Currently, the shares of Adidas AG. seem to be fairly valued. 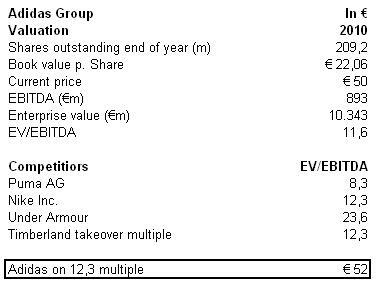 Using the takeover bid price of Timberland as the most recent real market multiple for a company in the sport apparel & footwear industry, we come at a fair value of €52 per share. 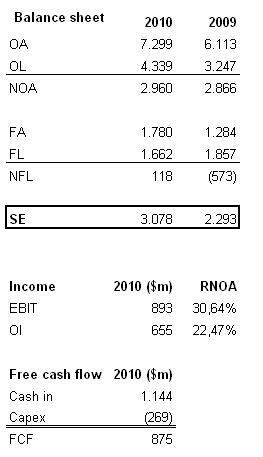 However it must also be noted that from a financial statement perspective, the operations of the group are very profitable, earning high returns on invested capital, indicating significant brand equity that is unaccounted for in the statements. One of the best sources that I have found on the global sport apparel and footwear industry is Kieve Saling´s Master thesis, Tracing the Portland Athletic Shoe Industry: Innovation, Time & Space, from Lund University in Sweden. When it comes to retail there is a clear divergance in strategy. 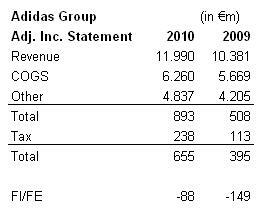 In recent years Adidas has put more emphasis on setting up their own retail stores. Both companies have been integrating ICT into various stages of their value chain. Distribution is the most obvious integration but marketing has been moving towards customization. I do not know however if this has been profitable in any way. On the same note, customer feedback mechanisms will be an important source of edge, in product development and design.